It's now been more than two weeks since New Times critic Lee Klein called out local chefs for being part of an "unholy alliance" due to their participation in a series of promotional events at Whole Foods, on account of the chain's supposed lack of support for local farmers. I detected a faint whiff of hypocrisy, in light of said critic's touting of New Times' "Iron Fork" event just hours later, an event sponsored by none other than Whole Foods and attended by some of those very same chefs. Then Professor Klein felt obligated to give me an education on hypocrisy. I'm not a very good student, but we each made our feelings known and hugged it out. In the meantime, what seems to have been forgotten along the way was the promise to deliver on those accusations about Whole Foods in the first place. Back on September 14 we were assured "more specifics on this in upcoming posts" and as part of my lesson plan on September 16, there was more reassurance that the subject would be picked up "soon enough." Two weeks, and 15+ posts from Mr. Klein later, and still no more info. I can only wait so long, and so decided to take matters into my own hands. I visited the Aventura Whole Foods this weekend, and paid some attention to what was locally sourced. The local pickings in the produce section were indeed pretty limited, but this should come as no great surprise this time of year as there's not much that's in season yet locally. I was able to score some very nice pea greens from Green Garden Organics, which lists a Miami address. The seafood section was abundantly stocked with local product: Key West pink shrimp, whole yellowtail, snapper, mahi mahi, spiny lobsters ... I'd hazard a guess that roughly 25% of what was in the seafood case had a "local" sign on it. There was also a large selection of locally produced honeys on the shelves, with at least three different producers offering Florida tupelo, saw palmetto, avocado, lychee, orange blossom, wildflower and other honeys. So, I'm still left wondering what could be the basis for the skewering given to local chefs a couple weeks ago. Anyway, investigation gave way to hunger as the spiny lobsters at $10/lb. seemed too good to pass up, and I brought home a few. 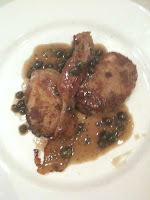 As for what to do with them, I drew inspiration from a dish I'd had at Sra. Martinez earlier in the weekend - a "late summer vegetable salad" with a gazpacho sauce. What follows is not so much a recipe, since I'm not big on measuring and such, but more of a post-hoc reconstruction. It's also perhaps an attempt to debunk the beliefs of those who think I eat out for every meal. First, the salmorejo (an Andalusian dish that is like a gazpacho, but thicker and creamier, and used more as a sauce than a soup). Took the crust off about 1/3 a loaf of peasant bread, chopped in big pieces and soaked in water. Four tomatoes (I used some slightly over-ripe vine-ripened tomatoes that were on sale), cored and quartered. Into the blender they went, then next into the blender a couple cloves of chopped garlic, 1/2 a red pepper chopped, a glug of sherry vinegar (1/4 cup? ), a generous amount of salt, and good olive oil until it started to look shiny and creamy (1/2 cup?). Done. You'll probably have extra. Next, the veg. Four white asparagus cut on the bias into about 3/4" pieces, about a cup of English peas, 1/2 of a small bulb of fennel, cored and thinly sliced, and a radish, sliced thin. The asparagus got big-pot-blanched (big pot of boiling water, good amount of salt) for a few minutes till tender, then into an ice bath to stop cooking. Same treatment for the peas. Drained them and tossed with the fennel and radish. Salt to taste. To plate: dress the veg with a little olive oil and mound on one side of a shallow bowl (Sra. Martinez used a ring mold for a prettier presentation). Pour salmorejo into the other side of the bowl. 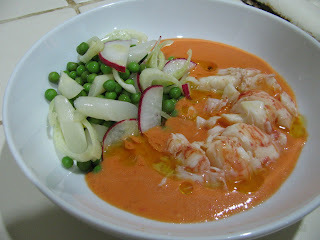 Lay the lobster meat over the salmorejo. Drizzle with good olive oil. Present to your awed significant other. I was pretty happy with how this turned out. The salmorejo had a bright tomato flavor and a creamy texture, with the sherry vinegar providing a smooth subtle tartness. The lobster was outstanding. Often I find that Florida spiny lobster can be tough and bouncy, but this was perfectly tender, briny and flavorful, interestingly needing no additional salt. Nice yield too, with a tail providing plenty of meat for one person (the picture above uses only 1/2 of one tail; the lobsters were about 1 1/2 lbs. each, or $15 a head). And the vegetables, some just barely cooked and others still raw, provided a nice complement to the lobster and the salmorejo. So while we wait for the dirt to be dished on Whole Foods, I'll happily eat what local products they do have available. Edited to add: Look, here's the dish I was trying to knock off - not bad, right? [*]There's plenty of good meat in the rest of the body if you want to go digging, I decided to make a lobster stock with mine and split the heads lengthwise, rinsed out the tomalley, and tossed them into a pot along with the tail shells, some carrot, onion, garlic, the rest of the fennel bulb, parsley and peppercorns, covered with water, simmered for about a half hour, removed all the solids and then reduced it by about half, skimming off any foam or scum that rises to the surface. Still haven't determined the stock's ultimate destiny. We did Manresa all wrong. I now know that Los Gatos is a good hour and a half away from Carmel, which was our home base the evening of our Manresa reservation. 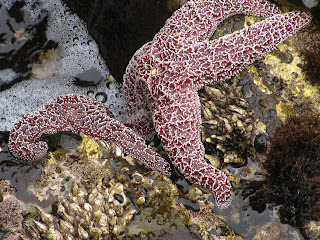 I now know that it was a major mistake to attempt a heady dining experience with the whole family after a day of tidepooling and hiking in Point Lobos Park and a loooong drive back up the coast. But when I planned our California trip (in fairness to myself, on very short notice), this was one of the destinations I didn't want to miss, and so - against my better judgment, or at least that of certain other members of the family - we made the trek to Manresa. With this preview, it shouldn't come as a great surprise that the meal was not a perfect success. Once we got there, Los Gatos turned out to be a charming little town, and the restaurant, on a side street off the main drag in what looks to be a converted house, is modestly unassuming for a place that has garnered such a lofty reputation. Inside, the exposed wood beam ceiling, earth-toned walls, and oriental rugs give a feeling of casual intimacy. We were greeted warmly and led to a table in the back that looked out on a small garden. The garden is a prevalent theme with Manresa, where Chef David Kinch has an exclusive arrangement with Love Apple Farms located nearby: the farm's produce is grown exclusively for the restaurant, a quite literal exemplar of the "farm-to-table" movement. In light of the long drive behind us and the return trip still ahead of us, the tasting menu was out of the question. All right, I questioned, and Mrs. F said "Absolutely not." Manresa also offers a four-course dinner, and further accomodated the kids by doing 2- and 3-course offerings for them. The menu appears to be divided into vegetable & seafood appetizers, fish items, meats, and desserts & cheeses, suggesting a natural 4-course progression, but you are free to choose however you wish and we mixed things up quite a bit. Indeed, between the four of us we tried thirteen different items, effectively (or ineffectively, perhaps) making our own tasting menu. It was something of an up-and-down experience. I had some dishes I thought were absolutely ethereal; some of the other ones we had were visual feasts but lacking in flavor (causing Mrs. F to proclaim that they were like "a symphony composed for the deaf"). After ordering, we were first brought two amuse bouches ("amuses bouche"?). The first to arrive, on a sheet of slate, were a few twirls of light, airy and greaseless parmesan churros, paired with leaves of crispy kale. These were neither the palate-cleaner nor palate-tweaker I typically anticipate from an amuse bouche, but there's nothing wrong with starting a meal with something crispy and fried either. The next amuse was more interesting, described by our waiter as the "Arpege egg," readily acknowledging the dish's source of inspiration, Alain Passard's L'Arpege. The egg is served in its shell and, working your way from the surface to the bottom, you find frothy creamy white, a tart dash of sherry vinegar, a sweet tickle of maple syrup, and the gooey rich yolk. This was an elegant and flavorful package. Having never tried the original at L'Arpege, I am in no position to draw comparisons. The bread was also quite nice, crusty outside and tender within, served with creamy house-churned butter, a corner of which is sprinkled with coarse sea salt. My first dish was the assorted shellfish, which is also described almost universally by those who have tried it as the "tidepool." And for good reason, as the visual association is almost inevitable. 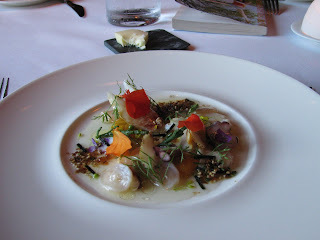 The dish featured a variety of seafoods - octopus, dungeness crab, geoduck clam, and buried further within, a couple tongues of coral-colored sea urchin roe, seemingly floating in a limpid pool of dashi given an inflection of refreshing tartness with the addition of green tomato broth. Both the dashi and the green tomato broth were just slightly more viscous than water, perhaps thickened a touch with xanthan. Scattered throughout were sea beans (a/k/a marsh samphire, a name that makes more sense to me since these are clearly not beans), various green leaves, orange and red nasturtium petals, and tiny purple flowers (borage?). In a few spots were little puddles of black and white sesame seeds and tiny matchsticks of nori, providing an additional dash of flavor. Yet another layer of contrast was provided by the addition of thin slivers of unripe strawberries, their green, sour note playing the role often played by citrus in combination with seafood. Mrs. F started with "summer snapper, sashimi style," the fish served raw and sliced usuzukuri style into very thin slices arranged in a spiral around the plate. The pristinely fresh fish was topped with good olive oil, slightly coarse sea salt, tiny chopped chives and very finely shredded kaffir lime leaf. 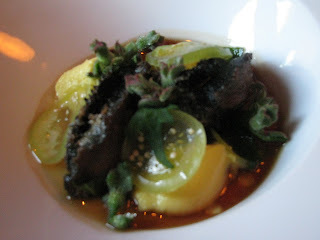 I enjoyed the clean and pure flavors, though Mrs. F found the kaffir lime a touch overpowering. 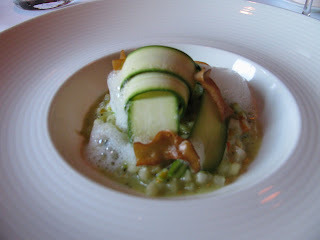 Next for me, a squash and courgette (zucchini) risotto "without rice," the vegetables cut into dice roughly the size of grains of rice, and cooked to a texture approximating a risotto - tender outside, but with still a hint of firmness within. The "risotto" was bound with an emulsion with the salty umami of parmesan cheese, the flavors echoed by a white froth on top. 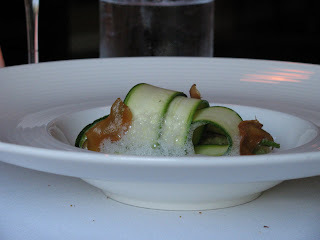 The dish was crowned with a twisted mobius strip of thinly sliced raw (or barely blanched) zucchini, along with little crispy wafers of mushroom. I usually find both summer squash and zucchini insipid, but this was an effective and pleasing use of their summer bounty. 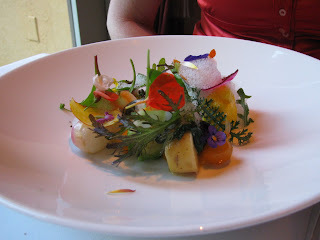 Mrs. F's next course, "Into the vegetable garden," is a signature item for Manresa. Like the "Arpege egg," it is also one that has something of a family tree. 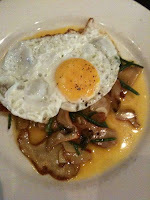 The original reference point for the dish is derived from French chef Michel Bras, and a dish he dubbed "gargouillou." Though the original gargouillou is apparently a simple peasant dish of potatoes and ham, Chef Bras' gargouillou is a garden-inspired assembly of dozens of different vegetables, leaves, herbs and sprouts (supposedly anywhere between 30 and 60 different items), some raw, some cooked, all united by a buttery ham-infused broth. It has been the inspirational springboard for many chefs, and Chef Kinch's own explanation provides intriguing insight into the evolution of his take on the dish. The iteration we had featured a cornucopia of different leaves and petals, plus cubes and rounds of various vegetables - zucchini, potato, turnip, tomato - some raw, some barely poached. Then as you progress further into the pile, you find a couple loose pyramids of vegetable purees, and a crumbly dark "soil" in which I tasted potato, chicory and maybe hazelnut. The elements of the plate were bound by a foam made from the vegetables' juices. It was a beautiful thing to look at, really like a garden on a plate. Unfortunately, notwithstanding the elaborate pedigree and gorgeous presentation, Mrs. F found the dish bland and underflavored. I recently saw Chef Kinch on Le Bernardin Chef Eric Ripert's new TV show "Avec Eric" talking about the dish, and he was explaining how as time has passed, he has pared away components of the dish in order to highlight the vegetables, specifically commenting that he didn't want to be guilty of overseasoning the "star ingredients" (the theme of the show). It is possible this restraint can be carried too far; either that, or perhaps Mrs. F doesn't love her vegetables enough. But I am also reminded of a tweet exchange I recently had with the immortal Gael Greene, prompted by her comment on Top Chef Masters that "Whenever a chef uses a foam I wonder what they're trying to DO to me." Interpreting this as an overbroad indictment of an entire technique, I helpfully suggested "Relax - it's foam, not Astroglide," to which she gracefully responded "I often wonder if the foaming chef ever tastes his foam. So often it's flavorless scum and detracts from an otherwise good dish." And she makes a good point. A bold or richly flavored ingredient can work well when aerated into a foam, but milder ones can often get lost; and here, if I hadn't known that the foam was made from the vegetables' juices, I would have never been able to tell you what it was. This was a dish I found more pleasing in concept and presentation than in flavor. I found my next dish, local black abalone, infinitely more satisfying on every level. Unlike most abalone I've tried, these, which are farmed in Monterey Bay, are mind-bogglingly tender, yielding to the gentlest touch of a knife and not chewy or bouncy at all. Their flavor is mildly but distinctly oceanic, reminiscent of octopus or geoduck. Two of these plump disks were propped upright in the bowl in a golden-brown umami-loaded broth, together with a few dollops of corn pudding, glassy-looking translucently golden-green slices of tomato, and a fascinating little green our server told me was called ficoide glaciale. These little sprigs, similar to the iceplant, were lightly crunchy, just slightly sour, and provided a sensation uncannily like a light spray of cool water. 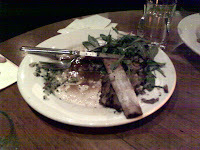 Next, working in reverse order of the pictures, the spring lamb dish was mine, featuring rosy slices of shoulder, a cube of tender confited tongue, a tangy yogurt-based sauce, black beans, some wilted and fresh greens, and - if memory serves - some roasted shishito peppers. The yogurt sauce was the component that brought this dish, which otherwise would have been well-prepared but unexceptional, to another level. The other items we had, however, did not impress as much. 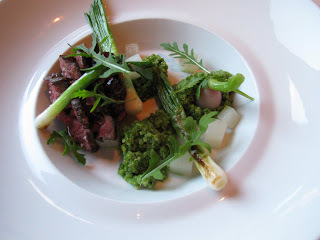 The beef bavette, which was cooked in its own fat, had a murky taste to it (Frod Jr. said the beef tasted like mashed potatoes), and I found the pairings - grilled spring onions, cubed turnips, and quinoa turned bright green with arugula - somewhat bland. 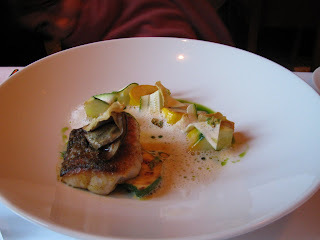 The roasted ling cod was good fish, but the accompanying zucchini, summer squash and eggplant - the first two sliced in various thicknesses and alternately raw or grilled, and all bound with a milky white froth - were also bland, and too similar to the "risotto" I had earlier. 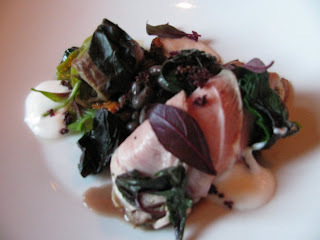 Mrs. F had "the season's first albacore," and also found the oil-poached fish to be underflavored. The cheese course which we followed with - described on the menu as "refined and perfectly mature" (perhaps more than we can say about our dining group) - again brought redemption. The cheeses come out on a little red cart, which our server told us was custom-made for the restaurant in France. The first cart mysteriously disappeared on arrival in the U.S., and a second one had to be commissioned. The cart is charming, but its contents are truly special. We had four cheeses, accompanied by house-made membrillo (quince paste). They were all indeed perfectly aged and a couple in particular - a Grayson (a Tallegio-like washed rind cheese made in Virginia) and a Brillat-Savarin (so rich and oozy it required more than a bit of dexterity to get it from the cart to a plate) were truly memorable. We let the kids pick desserts, and Little Miss F chose "exotic citrus with honey and spice," while Frod Jr. chose a hazelnut and cocoa tartine (they did not wait for pictures to be taken). The former featured some truly exotic citrus, various pomelo and tangerine hybrids, some with incredibly intense tartness to them, only slightly tamed by some honey's sweetness, and contrasted with an almost equally intense spearmint ice cream. The tartine, meanwhile, played along the boundaries between sweet and savory, with strong dark chocolate only lightly sweetened paired with a vibrant magenta beet granita, a creamy milk curd, and a sprinkle of pea flowers. As we headed out, a creamy, chewy salted caramel provided a treat to savor for the long drive home. I know and regret that we didn't do Manresa the right way. We were frazzled, we were burned out from driving, and some of us were a bit grumpy. I suspect that both the concept and execution of many of the dishes translate much more successfully when presented in a tasting menu format, and when the diner has more patience and focus than we had on our visit. On the other hand, while I had some truly memorable and exciting dishes (the shellfish tidepool, the abalone, and the cheese course would unquestionably fall in that category, and the "risotto" would come close), others were underflavored and I was pressed to even recall them only a few weeks later. Even so, I would love the opportunity to try the place again. Even from an imperfect vantage point, some things were clear to me. First, that Chef Kinch's cooking represents a uniquely successful, and uniquely personal, synthesis of a wide range of influences and ideas. The flavor profiles show French, Spanish, and Asian influences, including dishes unabashedly inspired by those created by other chefs, yet still come across as a consistent and individualized creative vision. The menu is driven by the farm and its bounty as much as probably just about any restaurant in the country, yet the methods and techniques liberally take advantage of the latest culinary technologies and concepts (two trends that many wrongly perceive as antithetical). And second, that next time I'm going without the kids. [*]Made special for Little Miss F. I was thoroughly charmed by how the waiter sized up how conservative her tastes were. When she showed little interest in what was on the menu and we asked if they could make a pasta for her, he willingly accomodated, then gently asked "With butter? ... and some cheese? ... and some vegetables?" with pauses between each addition to make sure each step was OK.
At first, I didn't have very high hopes for our first dinner in Carmel. Given that the meal was going to be sandwiched in between visits to Incanto on the front end and Manresa on the back end, I was OK with low expectations. 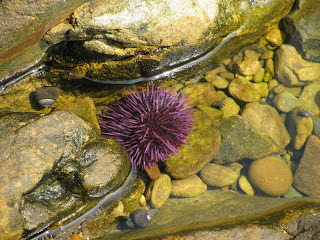 Then just a few days before we arrived, I got an email from the Carmel Valley Ranch where we were staying, advising that the resort had "partnered with acclaimed French Chef Michel Richard for our new signature restaurant -- Citronelle by Michel Richard." Well - that changed things. I've never eaten at Chef Richard's flagship restaurant in Washington DC[*] but I certainly knew of his reputation as a phenomenally talented, creative and whimsical chef. Maybe this dinner wouldn't be a letdown after all. But from the moment we set foot in the restaurant, something seemed amiss. First off, there was no signage whatsoever identifying the place as Citronelle - not in the resort, not in the entrance to the restaurant, not on the menu. Then out came an amuse bouche of - a lemon sorbet? Is it 1975? Followed by a bowl of french fries? They were good fries indeed, perversely reminiscent of classic McDonald's fries (and I say that as a compliment), but - could this really be how Chef Richard's reputation was earned? Aside from no evidence of the name, the menu also showed no signs of Michel Richard's influence. Where were the trademark dishes - the lobster burger, the 72-hour braised short rib? Nowhere to be seen. It turns out, I now know, that right around the time we arrived, Chef Richard and Citronelle had cleared out shortly after the resort was sold to new owners. Chef Flynt Payne (which has got to be one of the most manly names I have ever heard) was dubbed the new executive chef shortly aftwerwards. I don't even know if he was in the kitchen yet at the time of our visit. With this preview, it should come as no surprise that the meal in fact was something of a letdown; but I blame this mostly on the resort management which was responsible for emailing me about their "new signature restaurant" Citronelle, even as Chef Richard was packing up and heading out the door. It would also certainly suggest that it is too early to fairly evaluate the new incarnation of the dining room at the Carmel Valley Ranch. So this is much more in the nature of a "just passing it along" post rather than passing any sort of judgment. The menu was a fairly short list of maybe a half-dozen each of appetizer and entree options, and a few desserts, offered only as a $65, 3-course proposal. They were accomodating, however, when we proposed to split one 3-course menu between the two kids, with Little Miss F taking a vegetable risotto starter and Frod Jr. a quail main course, and then splitting (reluctantly) a chocolate torte for dessert. I had myself a pig-fest, starting with a pork terrine followed with a milk-braised pork shoulder, and closed with a cheese course. Mrs. F had a beet salad and the quail as well, finishing with some fresh doughnuts (which the kids happily shared). All of the cooking was technically faultless and well-executed. Among the more notable items, the pork terrine had a flavorful and well-spiced forcemeat, and was wrapped in bacon to give an extra salty porky punch. It was plated with pistachios and fresh nectarines, whose flavors paired nicely. The risotto, studded with summer vegetables, was also good, simple and satisfying. But - and this was likely a result primarily of the flux in the kitchen and the lack of time for a new chef to put his stamp on a new menu - very little that we had was particularly striking or memorable in any way. It was also less (in the way of quality, not quantity) than I would expect from a $65 meal, and the mandatory 3-course agenda was a downer. Edited to add: Perhaps the greatest revelation of the meal was the wine we had with it: Couloir Monument Tree Pinot Noir (2006). 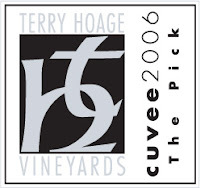 Monument Tree is a cool climate, Anderson Valley vineyard, and the winemaker for Couloir is Jon Grant, who is also the assistant winemaker for Turley Wine Cellars. I am a big fan of Anderson Valley pinots and this was a great example. It retails from the winery for $44 and we had it from the wine list at $77. The kitchen showed enough technical proficiency to suggest that they're capable of some good cooking. Just don't go expecting Citronelle (no matter what the resort's emails may tell you). [*]Chef Richard actually first made a name for himself in Southern California before shifting coasts to DC. I wanted to love Zuni Cafe. I really did. The Zuni Cafe Cookbook is one of my all-time favorites, not merely a compendium of recipes but a passionate and wonderfully written guide to how to cook with literally all five of your senses. It's worth the price just for Chef Judy Rodgers' roast chicken recipe alone, even if it is widely available on the internet. I actually don't often do recipes directly from the book, but there are any number of tips I've picked up from reading, and re-reading, that have been invaluable. 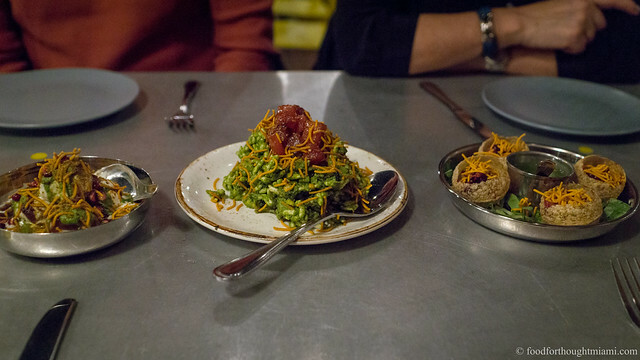 And besides, notwithstanding my interest in more contemporary techniques, I usually enjoy the "California school" of ingredient-driven cooking of which Zuni is a paragon. 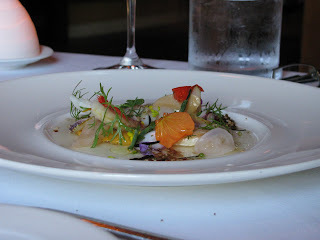 This was my second visit to Zuni, actually. The first was a couple years ago, when Little Miss F and I (having come out to SF a day before the rest of the family) went and ordered the legendary roast chicken. We had a perfectly enjoyable meal. Was it the best roast chicken I've ever had? Interestingly, no - as I noted back then, that honor actually goes to Miami's Michael's Genuine Food & Drink, which does an unabashed riff on the Zuni chicken, including basically every component but the bread cubes (which is a shame). It's possible Michael's chicken had an unfair advantage because we were eating it straight from the wood-fired oven, and (at our request) it was served whole so we got to pick on the delightfully juicy carcass. But that story's been told elsewhere. This time we had the whole crew together and I had the liberty of exploring some of the less-iconic items on the menu. We started with some Hog Island kumamoto oysters (breaking the "months with an R" rule for the occasion), a Caesar salad, and an heirloom tomato salad, then a spinach soup, a roasted squab, and a tagliata, along with orders of polenta and shoestring fries. I do love the space itself, a flat-iron shaped wedge with a long bar on the ground floor, some seating around the kitchen area with floor-to-ceiling windows looking out on Market Street, and a quirky upstairs area with several little passageways, nooks and crannies. Like our last visit, we were seated on a cozy perch in the second floor that overlooks the downstairs dining room and a bit of the kitchen. The Caesar was indeed an excellent rendition, another of the iconic Zuni dishes (the burger is probably the third - and it acquired its fame well before the current burger trend). In the cookbook, Chef Rodgers acknowledges "There is nothing clever, original, or mysterious about this Caesar salad. 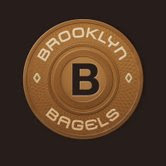 The main 'trick' we rely on is top-notch ingredients, freshly prepared." It works. This was as fine a Caesar salad as I've ever had. The heirloom tomato salad, on the other hand, was a real disappointment. On our earlier visit a couple years ago I had a tomato salad (it was summer after all) and it came with a bountiful and generous variety of plump, sweet, and tart heirloom tomato slices simply dressed with good olive oil and coarse salt. This time around - well, I had no idea you could slice tomatoes on a mandoline, but I'd swear that's what they had done. This $10 salad came with about 10 paper-thin slices of tomato, along with some thinly sliced cucumber, a scatter of green onion, and again a dose of good olive oil and salt. Aside from being almost absurdly ungenerous, the slicing of the tomatoes as thin as a pounded carpaccio robbed them of any semblance of juicy goodness. I mean, these are tomatoes, not truffles, after all.